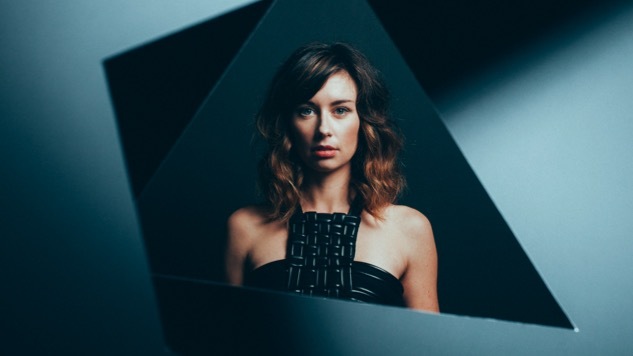 The Lera Lynn who appeared in HBO’s True Detective last season as a sad-eyed bar singer looked like a dark, moody mess. She sounded like one, too. The downers she co-wrote for the show with T Bone Burnett and Rosanne Cash helped her character—with scars on her arms, slightly hunched, singing about her least favorite life—make you feel like this is the kind of music you’d sing after realizing God’s not going to let you into heaven. Contrast that with Lynn’s real-life repertoire, which requires a richer medley of adjectives to properly introduce—and which is set to get a little larger April 29 thanks to the release of her third album, Resistor. That title, partly a nod to Lynn’s and collaborator Joshua Grange’s Resistor studio in Nashville where the album was recorded, is an apt summation both of Lynn’s attitude toward life—“resistor of the easy road,” she sings in the propulsive rocker that kicks off the album—and how her songwriting chops have always resisted easy categorization. The Texas native’s delivery, for example, is alternately delicate and menacing, vulnerable and moody. It’s been like that since her 2011 debut, Have You Met Lera Lynn? and on Resistor, she continues the introduction implied in her first record’s title. The True Detective scene-stealer says she’s ready to get past being known as the show’s “needle-dotted junkie girl” and is something of a genre-hopper on her new release, wrapping her poetry inside everything from Americana to toe-tapping rock to a few tracks “that make you want your mom,” she says, laughing. “I started playing guitar at 15, and I got a weekly gig playing at a Mexican restaurant,” Lynn says, recounting a career that propelled her to a national TV debut in 2015 on Letterman and to international performances earlier this year in locales like London and Moscow. “When I was in elementary school—grunge, Kurt Cobain, that kind of music had a really big effect on me. Dark Side of the Moon was one of the most important records of my early years. It completely reset my whole universe. That also extends to more than the playing. Earlier this year, she set up her own record label, Resistor Music, for which her new album will be the first release. She contributed graphic design work for the album cover and helped design limited-edition posters as goodies in return for pre-orders. She enjoys that part of the job. Some of the other things, not so much. That includes things like the hustle to get your music heard and the rise of Web-based streaming music services, which she regards as “terrifying” for the financial implications they represent to someone who makes her living by picking up a guitar and writing music that explores the twisting side roads of life and love. How many years—she wonders aloud, not seeming to be really asking for an answer—can an artist keep selling concert tickets before they run themselves into the ground? (“It’s exhausting.”) That said, she takes hope from one thing—the awareness she’s seeing in consumers toward understanding the consequences of what Lynn calls mindless consumption. The challenge she’s set for herself: make a record that people want to put in a shopping bag and take home, spend some time with and add to their collection. “And I’ve always wanted to maintain control of the music,” she says, partly a reference to the creation of her own label. “I’ve never liked the idea of accepting someone’s money in exchange for their say in my creative endeavors. I feel like I’ve done the worst part of the struggling and finally through many years of hard work have built up a team that will enable me to put the music out myself. And really, I have to say, it’s because of fan support I’m able to do any of it. Somehow, there are people who still understand the importance of buying music and how real that is to a musician and how impactful it can be on their career.